Come and enjoy the best that nature has to offer. Peaceful…beautiful…serene….are just a few words our guests have used to describe Indian Creek Campground in Cherokee, NC. Located on the Cherokee Indian Reservation at the southern edge of the Great Smoky Mountains National Park, the campground is secluded, quiet, heavily wooded, naturally beautiful and nestled on 88 acres between 3 mountain tops. 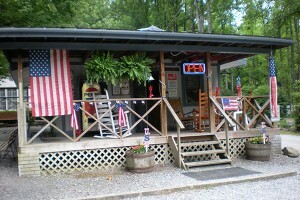 You’ll find just what you need at this small, privately owned, family oriented campground. There are 74 sites which include primitive tent sites, creek side sites for tents, pop-ups or small RV’s, full hook up sites (water, 30 amp. electric, sewer, cable) and a variety of cabins. It is back to nature camping at Indian Creek Campground. Unwind and relax to the sounds of one of our fast running streams. 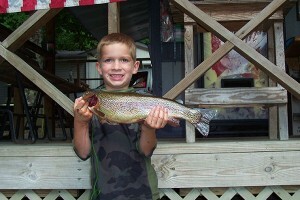 Test your fishing skills on Bunches Creek, which is stocked by the tribe’s Fisheries and Wildlife Management Program. Enjoy some time together as a family sitting around your campfire roasting hot dogs and marshmallows. No, there isn’t a pool, but what kid doesn’t love playing in a stream!! Our amenities include tent and RV sites, full hook up sites, cabins, camp store, clean restrooms with hot showers, stocked trout stream, playground, dump station, laundry, scheduled activities and WIFI hotspot for internet access. Opening Day is March 27th, 2019. If you would like to make a reservation for the 2019 or 2020 season, please call 828-497-4361. Indian Creek Campground also makes a perfect base camp for day trips in all directions-Gatlinburg, Pigeon Forge (Dollywood), Franklin (gem mining), Bryson City (white water rafting, tubing, Great Smoky Mountains Railroad) and numerous hiking trails throughout the National Park. The best things to do and see in Cherokee are the Cherokee Indian Museum (open all year), the Living Indian Village and Unto These Hills Outdoor Drama (in season) and Harrah’s Cherokee Casino. If you need information about any of our services, please feel free to use our contact form, send us an e-mail to info@indiancreekcampground.com, or give us a call at 828-497-4361.